Focusing on the reigns of Frederick the Great of Prussia (1740-86) and Maria Theresa of Austria (1740-80), James Van Horn Melton examines in this book the origins, aims, and achievements of the compulsory school movements in these states. Melton draws on a broad range of sources to show how school reform was part of a broader effort to transform social, economic, and cultural behavior at the popular level. List of tables; List of abbreviations; Acknowledgments; Introduction; Administrative divisions of the Habsburg and Hohenzolln monarchies, 1780; Part I. Cultural and Religious Forces: 1. 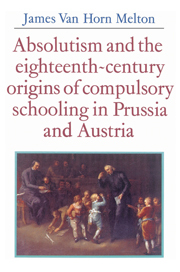 Popular schooling in early modern Prussia and Austria; 2. The rise of Pietist pedagogy; 3. From image to word: cultural reform and the rise of literate culture in Theresian Austria; 4. The catholic appropriation of Pietist pedagogy: Johann Ignaz Felbiger; Part II. Social and Economic Forces: 5. Mastering the masterless: cameralism, rural industry, and popular education; 6. From compulsory labor to compulsory schooling: education and the crisis of seigniorial authority; Part III. The Limits of Reform: 7. School reform in Frederickian Prussia; 8. The Theresian school reform of 1774; Conclusion; Selected bibliography; Index.